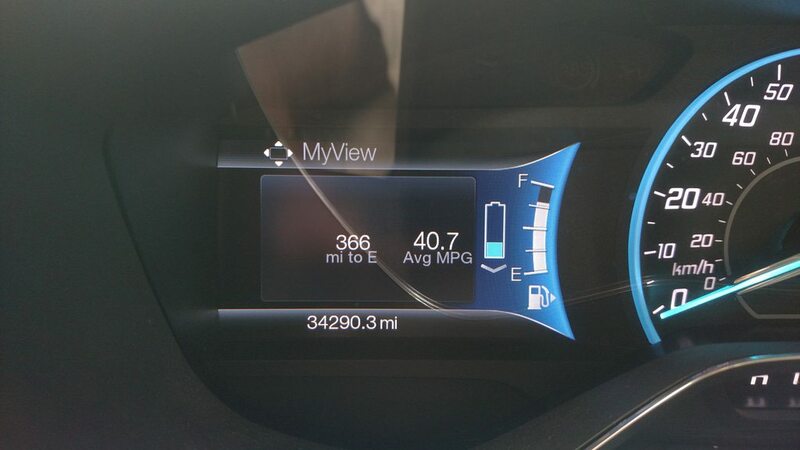 I have a 2013 C-Max Hybrid SEL that I bought used about 9 months ago. No major issues so far. This week, I've noticed that after filling up the tank completely, the fuel gauge shows only 3/4 full. I know for certain based on the number of gallons I put in the tank that it is full. As I use the first quarter of fuel, the gauge will ping pong back and forth between 3/4 and the actual fuel level. After the first quarter, it seems dead accurate again. Photo attached showing the gauge after a complete fill up. Any ideas on what might be causing this or how to fix it? Provided it only affects the top quarter of the tank, it is just an annoyance, but if it starts affecting the rest, I may one day find myself running out of gas on the side of the road. I'd say it is likely a defective sending unit in the gas tank (a stuck or partially stuck float). The other possibility is a poor ground contact which is easier to check/fix but would result in more intermittent and random fuel level readings. how many gallons are you putting in? when it's down below 50 miles to empty? I usually run mine down that low to 50-100 miles to empty and takes a good 11-12+ gallons to fill it up. i think it's a 13.5 gallon tank. The official capacity is 13.5, but it has been stated here, by those that have ran the tank down to empty, that it is closer to 14 gallons or just over. Hybrid is 13.5 gal and Energi is 14 for the window stickers. When I fill up my 16 SEL and the tank is red with no line above empty it takes 12.5 and usually says 30 miles left or so. Fuel tank usable "rated" size (13.5 gallons) is less than "fill up" size. There is a standard for tank size rating. For example, filler pipe, vapor air space at top of tank, fuel lines, low area at bottom where fuel pump usually sits and can't be reached by the pump are excluded from the volumn calculation of rated tank capacity. In addition, if you fill the tank beyond the pump shut off, fuel can enter the EVAP system. Filling when not on flat ground, can result in fuel in the air space. It was explained in an ariticle and discussed prior. You can google and likely find it or similar article. So, how did this thread get so far off topic from the dash fuel gauge not showing full? Back on topic. I agree with Louder North. IIRC, the fuel level sensor input is to the the Body Control Module and then to the instrument cluster via the CAN. So, if the instrument cluster is showing an incorrect "full" fuel level but as you use fuel moves lower, it's likely the sensor (including float). The company I used to work for made floats for fuel tanks. It is possible that the float is defective in that it is porous. This will lead to fuel absorption and a float weight heavy enough to make it sink. This is most likely the source of your problem. Easy fix! Thought I'd provide an update. This problem has gone away on its own. I have done about 10 fill ups since I wrote this and it hasn't happened again. Fingers crossed the problem never returns.